Season 2018 | Episode 8: Galveston, Texas – Bull Redfish! March 19 (Monday) – 12:30 p.m.
June 5 (Tuesday) – 3:00 p.m.
June 10 (Sunday) – 8:00 a.m.
September 11 (Tuesday) – 3:00 p.m.
February 19 (Monday) – 5:30 a.m.
February 22 (Thursday) – 8:30 p.m.
February 23 (Friday) – 2:30 a.m.
February 23 (Friday) – 8:30 a.m.
May 14 (Monday) – 5:30 a.m.
May 17 (Thursday) – 8:30 p.m.
May 18 (Friday) – 2:30 a.m.
May 18 (Friday) – 8:30 a.m.
Galveston (www.galveston.com) is a vacation paradise and outstanding fishing destination melded into one. From flounder to cobia and trophy class red snapper, they’re come here in solid numbers. On this trip, Poveromo teams up with Willard Franklin III to fish for bull reds, which swarm the island in incredible numbers during late summer and fall. 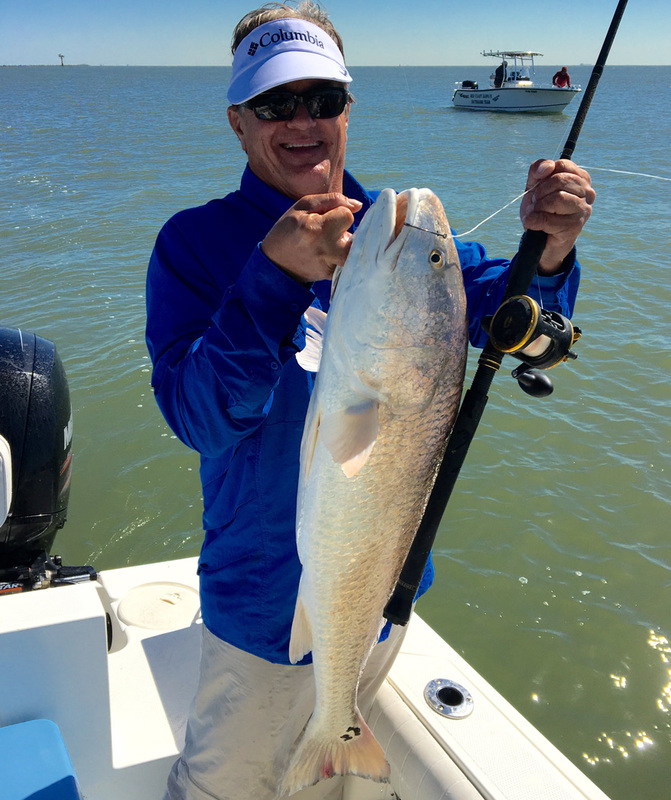 Franklin is an accomplished recreational angler who enjoys catching big Galveston redfish. Aboard his “Four W’s” – a beautiful Mako 234 (www.mako-boats.com) powered by twin 150hp Mercury FourStroke outboards (www.mercurymarine.com), Franklin takes Poveromo out by the jetties, where they anchor and soak live and cut baits. Sure enough, it isn’t long before the bull redfish keep the guys busy! This episode showcases just how good this fishery can be off Galveston, as well as the little things that make a big difference in keeping the bite going strong. The Four W’s docked at the Galveston Yacht Basin (www.galvestonyachtbasin.com), whereas the San Luis Resort Spa & Conference Center (www.sanluisresort.com) hosted the Poveromo team.